In her June 15 Speech from the Throne, Alberta Lieutenant Governor Lois Mitchell explained that past provincial governments have not always provided stable funding for essential public services. In the speech, Alberta's new government vowed to begin to rectify the situation by restoring stable support for a variety of public services, and a particular emphasis was made with respect to public health care. "We will invest in stable and predictable funding for our health system because universal, accessible, high-quality health care must be there when Alberta families need it – and because the time has come to meet our society’s growing need for community services like long-term care and home care," the Speech from the Throne asserted. "There are ... hospitals to build and renovate." In its response to the speech, the editorial board of the Calgary Herald questioned whether the Government of Alberta could continue to afford its level of public health care spending, writing, "A review of the province’s finances is welcomed, particularly around health care, where spending has ballooned and is arguably unsustainable." The editorial continued, "The dilemma, of course, is that climbing health-care costs pinch other priorities, such as the education system the NDP government identifies as critical to the province's prosperity. From 1980–81 to 2013–14, spending on health soared, from consuming 18 per cent of all revenue to absorbing about 40 per cent. That's meant that the amount of revenue dedicated to all other government spending, including education, has fallen from 82 per cent to about 60 per cent." Has Alberta’s public health care spending ballooned to the point of being unsustainable? Have Alberta's health care costs pinched funds from other public services? These are significant claims that can only be answered through empirical research into the historical levels of Alberta's expenditure on health care and other public services. 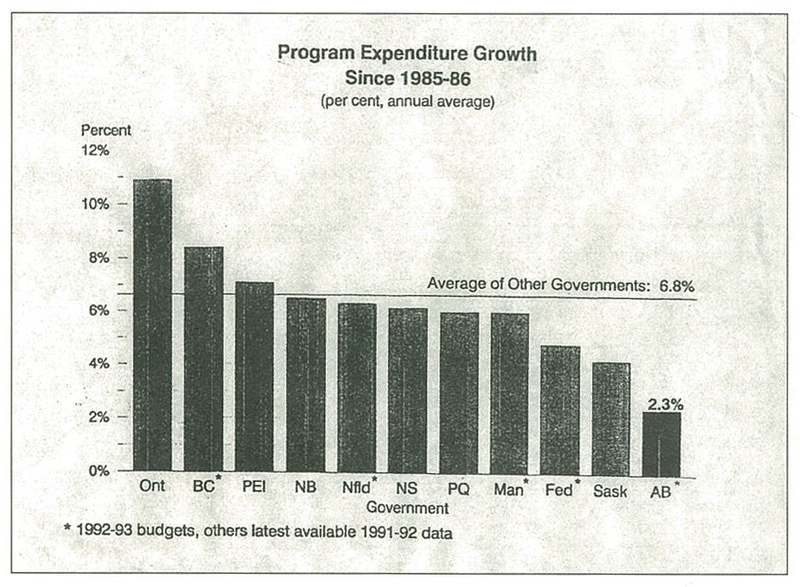 My last blog post debunked the persistent myth of Alberta's high public spending, and showed that this widely held but false belief has existed in our province since at least the early 1990s. Here I'll focus specifically on Alberta's health care spending and scrutinize the veracity of the claims made by the Herald’s editorial board about the supposed unsustainability of Alberta's health-care spending. In the 1960s, Albertans and Canadians chose to implement a system of universal public health care. Health care costs were rising to unsustainable levels and a public system was the best option for reining in costs. By contrast, private health care was allowed to flourish in the US, and by 2009 health care costs south of the border were about twice as high on a per capita basis as those we enjoy in Canada. In Alberta, overall public expenditure and public health care spending specifically have been low relative to the province's gross domestic product (GDP) for decades. For example, when Ralph Klein became premier in 1992, he inherited "a tight ship" from Premier Don Getty’s government. As Parkland Institute author Kevin Taft argued in his national bestselling book, Shredding the Public Interest: Ralph Klein and 25 Years of One-Party Government, "By 1992, there was plenty of information circulating within the Getty government that showed spending on most public services had dropped markedly from 1985 levels." Yet, Premier Klein claimed at the time that public spending levels in the latter half of the 1980s and early 1990s were out of control. 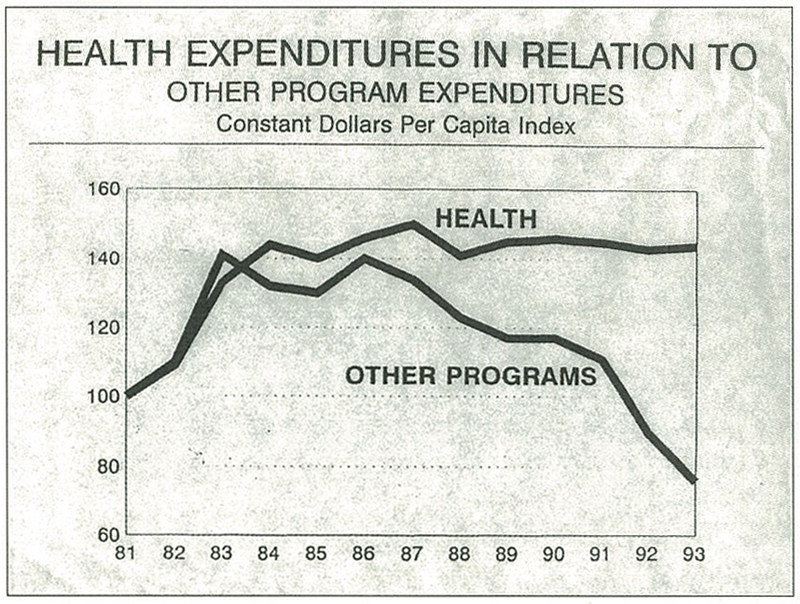 Taft then compared public spending on health care and other programs from 1981 to 1993, using the chart below, "Health Expenditures in Relation to Other Program Expenditures," to directly contradict "the Klein government's claim of skyrocketing health costs." So, during Getty's tenure as premier from 1985 to 1992, health care spending was relatively steady with a small decline from the 1987 peak. In direct contradiction to the Calgary Herald's claim about the supposed ballooning costs of public health care, Taft observes that "The reason health care spending takes a bigger piece of today's budget is not because it has gone up, but because other programs have fallen so sharply." Adding to the shakiness of the Calgary Herald editorial board’s claims, the trend of public health care taking a larger portion of the Alberta provincial budget because of cuts to the rest of the public sector would continue during Klein's tenure from 1992 to 2006. In fact, Klein reduced the size of the public sector from 22% of our provincial GDP to just 12%. In other words, Alberta’s public sector was reduced by 45% in comparison to the size of our overall economy. 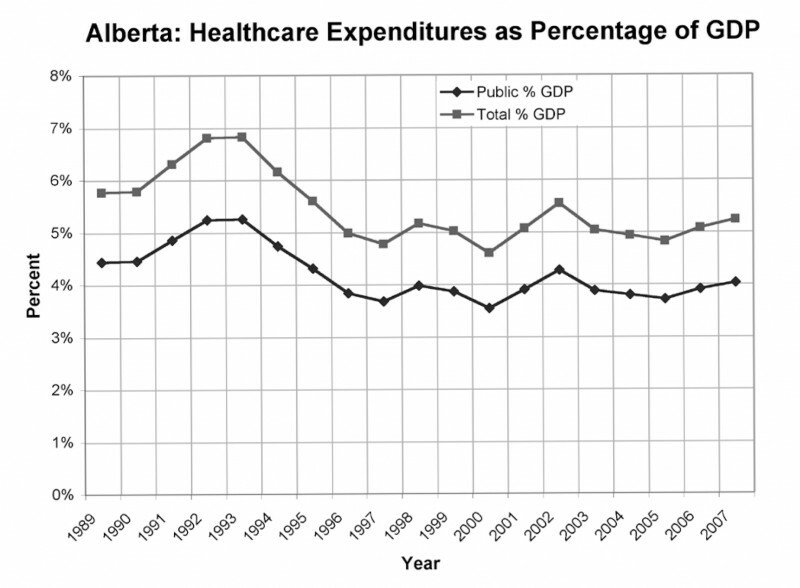 When inflation and population growth are taken into account, Alberta's health care spending under Klein grew only slightly and actually declined as a proportion of GDP. As shown in the chart below, taken from the 2009 Parkland Institute report Crisis? What Crisis? Public Health Care and Affordability in Alberta, our provincial health care spending was 3.97% of GDP in 2006, down from 4.45% of GDP in 1990. This means that Alberta’s 2006 health care spending was even more affordable than its already-sustainable level of health care spending in 1990. Klein achieved this reduction in public health care in comparison to our province's GDP in part through his government's substantial cuts to health care funding in the mid-'90s. Between 1994 and 1996, the Klein government cut public health care spending by 21%. These cuts were so large that Alberta's total public and private health costs did not surpass its 1993 peak until 2001, and our province's public spending on hospitals had yet to reach its previous high by 2009. Total health care spending increased significantly in the decade following the deep cuts of 1994–96, but the cost increases of 1997–2007 were not because Klein reversed his position on public spending. As illustrated in the chart below, from the same Parkland report, spending in the "Other" category was the main reason for the increase of overall health costs in Alberta. This significant increase in the "Other" category was driven by inflated prescription drug costs caused by Prime Minister Mulroney's decision to increase patent protection for drug companies from 7 to 20 years. 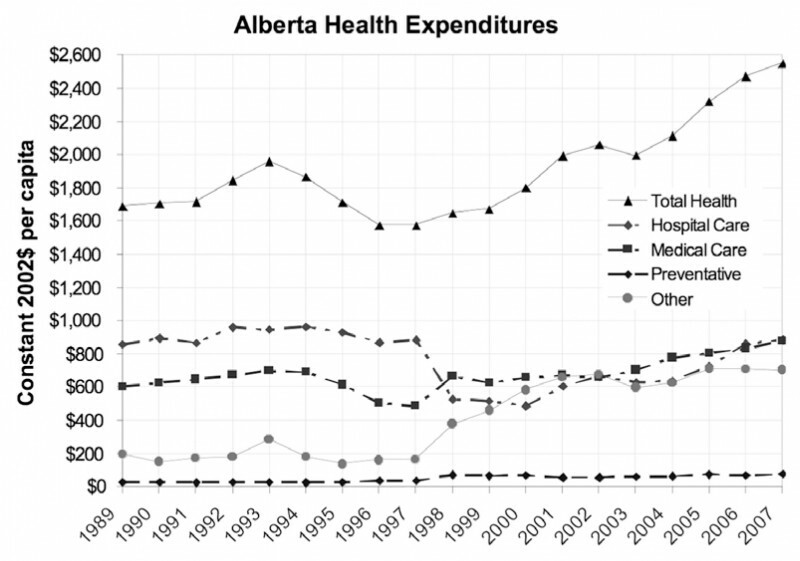 The public components of Alberta's health care system, such as hospitals and emergency services, did not see significant cost increases from 1997 to 2007. In fact, hospital spending dropped dramatically under successive Alberta PC governments. Hospital spending as a proportion of overall public health care spending went from 44.7% in 1975 to 27.8% in 2009. The costs for pharmaceuticals doubled over the same period because of the changes to patent laws. In 2009, Parkland Institute called for increased attention to the dramatic increase in the price of pharmaceuticals, but the Tories instead cut surgeries and hospital beds. In the last five years, Alberta has increased its annual expenditure on health care, but these increases were needed to repair the damage done in the name of deficit reduction under the Klein regime. Alberta had easily the most sustainable level of health care spending of all the Canadian provinces after Klein retired as premier. In 2007, Alberta's total health care spending as a proportion of GDP was 7.3%. Saskatchewan had the second lowest health care spending as a proportion of GDP at 10.6%, Ontario and BC came in at 10.9%, and Quebec was at 11.3%. The national average that year was 10.6%. In 2014, we saw a similar provincial comparison. 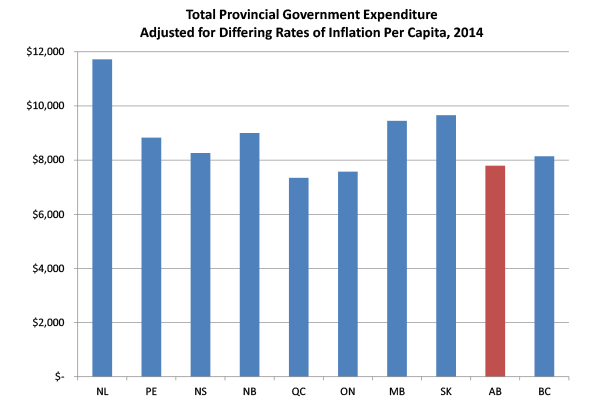 As illustrated in the chart below, taken from the recent Parkland fact sheet on public expenditures written by Parkland distinguished research fellow Greg Flanagan, Alberta's total government expenditure per capita was the third lowest amongst the provinces last year. Only Quebec and Ontario spent less per capita than Alberta last year, and Quebec and Ontario may enjoy economies of scale because of the size of their respective populations. 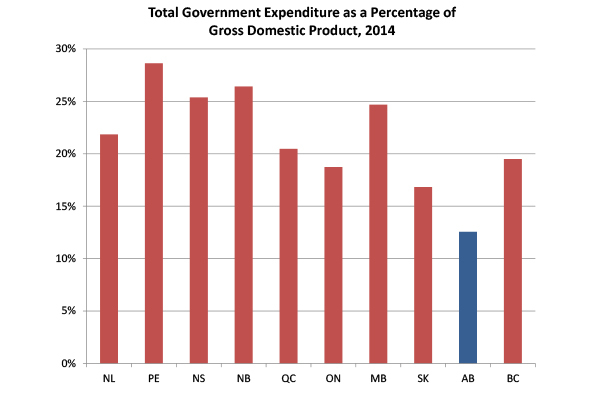 Furthermore, as shown in the next chart, "Total Government Expenditures as a Percentage of Gross Domestic Product, 2014," when we compare the total government expenditure of the provinces as a percentage of their respective GDPs, Alberta has by far the most sustainable level of public spending of all of the provinces. In summary, the claim made by the Calgary Herald's editorial board that Alberta's health care "spending has ballooned and is arguably unsustainable" is suspect because Alberta’s total public expenditure in 2006 was 12% of GDP and in 2014 it was 13% of GDP. The next closest province in 2014 was Saskatchewan at 17% of its GDP, and the national average by this measure was 22%. In other words, Alberta's level of public spending is more affordable and sustainable than the levels maintained by the other provinces. My research shows that from 1985 to 1992 Premier Getty kept health care funding fairly steady while he cut other programs significantly. Furthermore, Premier Klein only slightly increased health care funding from 1992 to 2006, while reducing the overall size of the public sector by 45% in comparison to our GDP. This means that the Calgary Herald editorial draws a false and misleading conclusion in claiming that it is because of supposed ballooning health care costs that health care has come to comprise 40% of our provincial budget. The fact of the matter is that health care has come to take a larger proportion of Alberta's budget over the last 30 years because successive Tory governments made substantial cuts to other public services, making health care appear, as the Calgary Herald put it, to "pinch other priorities." The challenge before the new provincial government is to figure out how to maintain the current level of health care spending while beginning to address the substantial cuts made to other essential public services by past governments. Clearly, the revenue side of the ledger will need to be a priority. The new government's second piece of legislation in the short spring sitting, "An Act to Restore Fairness to Public Revenue," begins to address the billions of forgone revenue that resulted from the Klein government's decisions to flatten our personal income tax system and to reduce our corporate tax rate from 15.5% to 10%. It remains to be seen if the current Alberta government will follow through with its promised resource royalty review, and if the review panel will recommend that our government start collecting the billions in forgone royalties that the people of Alberta have lost out on in the last five years.